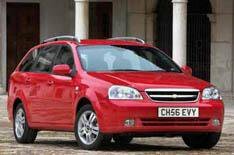 Chevy adds auto estate to Lacetti range | What Car? Chevrolet has launched a new version of its Lacetti estate car with a standard automatic transmission. The Lacetti 1.8 SX Auto Station Wagon costs 12,795 and comes with a four-speed automatic gearbox. The car accelerates from 0-62mph in 12sec, with a top speed of 116mph. Average fuel economy is 32.1mpg, with carbon dioxide emissions of 210g/km, putting it in VED band F, which costs 205 a year. Standard equipment includes four electric windows, traction control, front and side airbags, 15-inch alloy wheels, air-conditioning, electric door mirrors and a leather-covered steering wheel and gearknob. There's also a cooled glovebox compartment and a CD player with iPod or MP3-player compatibility.